﻿ E-ink-Reader. BATTERY REPLACEMENT IN THE ELECTRONIC BOOK. In a year - another after purchase of the electronic book comes the moment of ageing of its battery. The battery charge ceases to suffice for a long time, it quickly charges and also quickly discharges in the e-book reader. It would be desirable to replace such battery, but it is hard to make, because batteries for many models electronic books are not on saling in shops. To make replacement it is necessary to address in the authorised service centre which is engaged in repair of readers of your model. And how to be if the nearest authorised centre is on distance more 500 kilometres, or nobody in the country in general does not have service centres of the manufacturer? If you the owner of reader Lbook V3, Lbook V3 +, Lbook V3 Light, Lbook V3 + Light - to you have good luck. 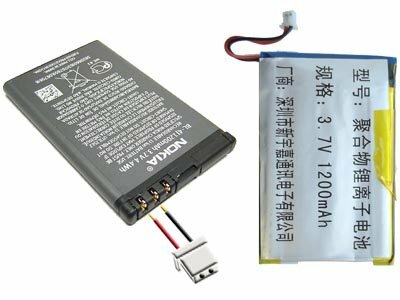 You can go to any shop on sale of cellular telephones and to buy the battery for mobile phone NOKIA of type BL-4C. It is ideally suited for these models of electronic books in the sizes and capacity. Attention: Authors do not bear responsibility for infringements of work of the electronic books, received as a result of application of this information. Everything that you do - on one's own account! Application of this technique removes the electronic book from warranty service! If you have the book of other model, then for selection of the similar battery first of all you need to defined there is in it a scheme of the controller of a charge. You can make it simply having counted quantity of pins of a socket of the battery. Batteries without charge controller have two output - plus and minus three O controller - plus, minus, and the controller output or two outputs. What for there is a controller in the battery? It has made to preserve the battery from the redischarge, a recharge and an overheat (and it is possible and from explosion). At rise in temperature, achievement of a maximum or a minimum of a charge the controller sends the information on a battery status through the third pin to the electronic book. Theoretically each manufacturer of storage batteries has the own controller of a charge, but in practice it turns out that there is only few types of them. Within one type controllers is interchangeable. For those who want to get acquainted with the operation of the controller battery, we have prepared this article. Let's try to find a suitable the battery, for an example, to electronic book Lbook V5. The factory of batteries at it reminds a small bag with three wires terminating in a socket. The sizes of the battery: 44.5 x 60 x 3.6 mm. Type lithium-polymeric, capacity 1000 mA/h, voltage 3.7 - 4.2 volts. Marks: V5-364560. Colours of wires the following: red - battery plus, yellow - a controller output, black - a battery minus. 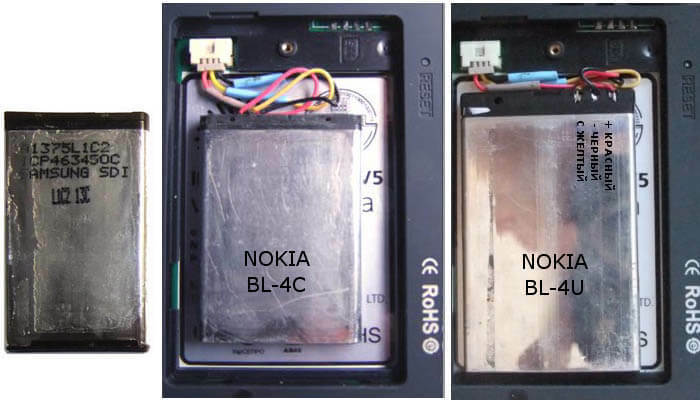 Of batteries from cellular telephone is the closest on dimensions (the thickness here is very important - the cover of a compartment of the battery differently will not be closed) NOKIA BL-4C and NOKIA BL-4U. These accumulators all the same a bit thicker than the factory installing. We remove a film with marks from the battery and the bottom lid - so it hardly becomes more thin. We wipe its alcohol that the battery's surface was not sticky. Further from the old battery we disconnecting wires with a socket and if necessary lengthen them, to solder additional slices of a wire and isolating places a soldering. We solder conductors to pins of the new battery and it is established into usual place. Now we turn on the e-book reader. If the e-book reader switch on, and the new battery works - that on it all. If the book either does not switch on, or is not charging, the controller of a charge from the new battery means has not suitable to your device. In this case it is necessary to open the old battery case, to take from it the controller, and to interchange the position of it with the controller from battery NOKIA. On the right in drawing the accumulator of electronic books Pocketbook 360, 360+ and 360+ New, 301+. It also was installing in e-book readers Orsio. Marks on the battery H503456 1000 mAh HC T0076. Dimensions: 57 x 34 x 4.8 mm. The controller is located on the top part of the battery, but at the same time on an exit only two pins (plus and a minus). You can replace such battery on Nokia BL-6U, having removed a factory's socket with wires from the old battery and having soldered to the new battery. This battery is a bit less on capacity, but well approaches in the sizes NOKIA BL-4C. NOKIA BL-5C - on millimetre thicker than the native battery, but many users of electronic books Pocketbook 301 + successfully replaced accumulator H50345 with this model. At such replacement controller pin on batteries NOKIA, marked by an empty circle, remains not soldered. On the right side of the picture battery of eBooks WEXLER E6001. Marking on the battery 3.7 V 1200 mah. and many Chinese letters. Dimensions: 58 x 34 x 4.2 mm. Controller of the battery also has only two leads (plus and minus). Such battery can be replaced by Nokia BL-4J, removing the factory connector with wires from the old battery and solder the new one. This battery is perfect in size and capacity. When such a change on the touch controllers in NOKIA batteries, marked as empty circle remains not soldering (unused). In the conclusion we will result the table of the sizes of the batteries used in cellular telephones NOKIA.